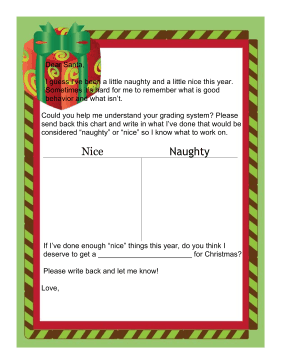 This printable letter to Santa weighs a child's naughty and nice behavior to see which one wins out. I guess I've been a little naughty and a little nice this year. Sometimes it's hard for me to remember what is good behavior and what isn't. Could you help me understand your grading system? Please send back this chart and write in what I've done that would be considered "naughty" or "nice" so I know what to work on. If I've done enough "nice" things this year, do you think I deserve to get a _______________________ for Christmas? Please write back and let me know!